Happy Eid! (June 2016)- Present Haul: I GOT A NINTENDO 2DS AND MORE! Hello, guys! This is Arca, and today was the first day of Eid! It is a Muslim holiday I celebrate that happens after the month of Ramadan ends. It lasts for three days. 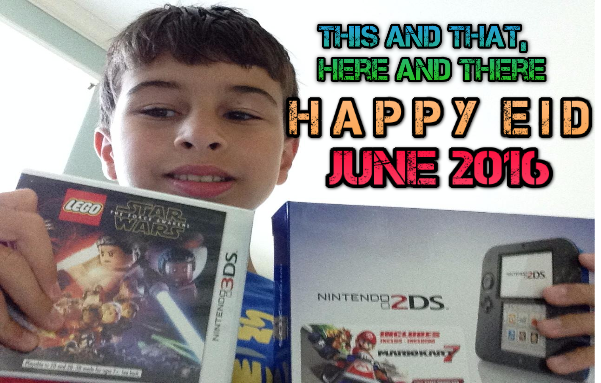 The other day, my dad took me and Onur to Best Buy to buy a Nintendo 2DS as a gift. Along with that, we got the LEGO Star Wars: The Force Awakens Videogame and a pack of three Star Wars styluses. You can see the box for the 2DS above. 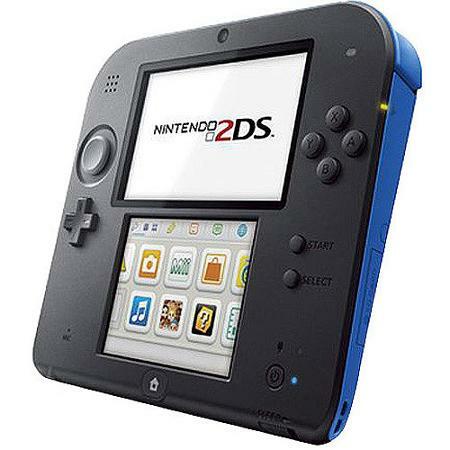 The back of the 2DS has parts that are electric blue. At Best Buy, they also had the color red available, but I chose blue. It comes with a download code for Mario Cart 7. What makes the 2DS so special is that you can play any Nintendo handheld game that exists whether it is for the 3DS or a normal DS. So if I get a 3DS game or a normal DS game, I will be able to play both using the 2DS. Of course, when you play any 3DS game, it won't be in 3D.This is hence the name "2DS", so it won't hurt your eyes by showing images that pop out without any 3D glasses since it can't do that. Also, the entire thing is flat and cannot be folded in half. All the controls are the same as the 3DS, except that it is spread out on two parts. You can see a picture of the 2DS above. It cost about $80 at Best Buy. You can see the case for the LEGO Star Wars: The Force Awakens game above. It shows a LEGO version of the movie poster in the background. Even though it says it is for the 3DS, it still is compatible with the 2DS system. It cost $30 at Best Buy. Above there is a picture of Onur playing the LEGO Star Wars game. He has played it way more than I have and seems to be enjoying it. The game is a video game version of a LEGO adaptation of the movie. Last but not least, I got a pack of 3 Star wars styluses to use for the 2DS. One is a TIE fighter, the other is Kylo Ren's lightsaber, and the last one is a First Order stormtrooper helmet. At Best Buy they only cost 2 dollars. Happy Eid everybody! I hope you enjoyed this post. Stay tuned for tomorrow's post! BBYYYYEEEEEEEE!! !